Dramatic reading of Chief Joseph’s “Account of His Trip to Washington, D.C.” (1879) by Q’Orianka Kilcher. 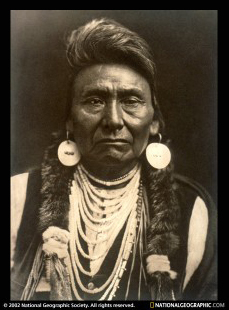 Activist and environmentalist, Chief Joseph. Photo: National Geographic. Chief Joseph led the resistance to the ongoing encroachment of Nez Percé’s lands in the 1870s, but his people came under fierce attack in 1877. He was forced to lead his followers toward the Canadian border, where they were defeated forty miles from the border, in Montant on October 5, 1877. He was sent to Indian Territories in Oklahoma where he continued to speak out against the crimes of the U.S. government as he did in his visit to Washington in 1879. Chief Joseph’s account is read here by Q’Orianka Kilcher on February 1, 2007, at All Saints Church, Pasadena, Calif. The excerpt is from Voices of a People’s History of the United States edited by Howard Zinn and Anthony Arnove.